Established in 1963 as Pinault — later Pinault-Printemps, later Pinault-Printemps-Redoute, most recently PPR, and completely renamed as Kering this past March — is one of the most comprehensive parent company of luxury brands, including Gucci, Bottega Veneta, Saint Laurent, Alexander McQueen, Balenciaga, Brioni, Christopher Kane, and Stella McCartney among others as well as sports brand Puma. 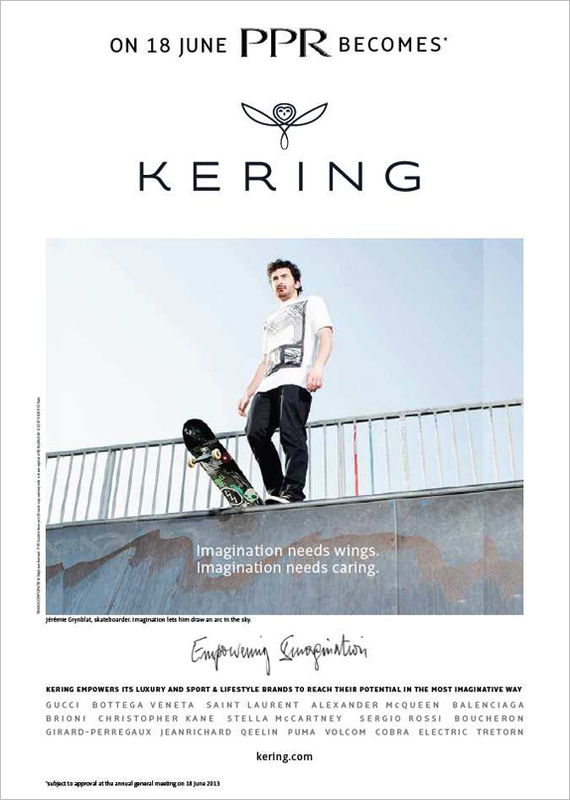 Family-owned since its inception, Kering is present in more than 120 countries, it employs 33,000 people and generates 9.7 billion euros in revenue. The new name was created internally with help from Havas Lifestyle, who are also credited with designing the logo and identity while Dragon Rouge is credited with brand strategy and the signature. First and foremost, Kering can be pronounced as ‘caring’ in English, which expresses our company culture of taking care of our brands, people, stakeholders and the environment. The suffix ‘-ing’ expresses the idea of movement, one of the constants in the Group’s history, as well as its international dimension. The stem ‘ker’, meaning home in Breton, is a proud reminder of our origins in the Brittany region of France. Our new emblem, the owl, represents vision, as well as being a sign of wisdom. A discreet and protective animal, it is a powerful symbol for a Group that spots potential and guides and nurtures its brands and people. With its sharp vision and 270° swiveling radius of the head, the owl represents Kering’s visionary character and foresight, its ability to anticipate trends and spot the potential in people and brands. A protective and unobtrusive creature, the bird of the goddess Athena, it symbolises wisdom and intelligent activity. The previous logo was exactly what most acronym-based logos for corporations end up looking like: stiff and forgettable. Nothing necessarily wrong with it but when you see the alternative, as is the case here, you wonder why companies will settle for so little. The new logo is an excellent evolution that establishes the parent company of all these luxury brands as a brand all its own. (It could be argued that a parent company should not call too much attention to itself and recede to the background with a stiff and forgettable logo). The owl icon is charming and sophisticated, something you could see debossed on a black leather folder with financial numbers inside, yet, in the way the owl’s face is drawn, there is an interesting playfulness to it. The airy wordmark is a great complement to the owl, if a little big in relationship. It has just the right amount of customization in the little swashes on the “K” and “R” and nothing more. Lastly, our new signature, ‘Empowering Imagination’, places imagination at the heart of our business, enabling us to create value in the widest sense. 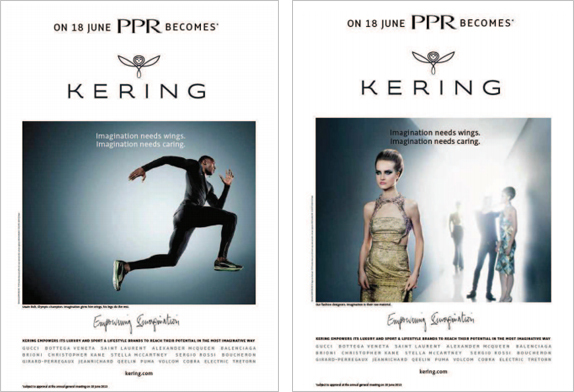 At Kering, we encourage and take care of imagination to push our brands and teams to new limits, to create, innovate and realise their artistic and financial potential — in the most sustainable manner. Launch campaign print ads, how all the elements come together. Then things start to get wonky in application and with the introduction of the handwritten signature. It’s like another company altogether. One trying to be hipper but keeping that fashion-world-print-ad aesthetic of forced bluntness. This is only the launch campaign and its point is to communicate the name change and introduce the brand’s elements so hopefully as recognition rises, the applications will get better. Thanks to Witek Gottesman for the tip.